Homeland Security Appropriations Bill Purports to Restrict Use of Funds for CAPPS II, 10/1/03. October 1, 2003. 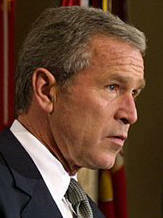 President Bush signed HR 2555, the "Department of Homeland Security Appropriations Act, 2004." The bill contains language prohibiting the use of funds for the Computer Assisted Passenger Prescreening System (CAPPS II) program until the General Accounting Office (GAO), which is an arm of the Congress, issues a report to the Congress in which it finds that the CAPPS II program meets certain specified criteria set out in the bill. However, while this language is in the bill, and the President signed the bill, the President wrote in a separate signing statement that this language of the bill is ineffective under the Supreme Court's opinion in INS v. Chadha. Bush wrote that while the language is mandatory, he will construe it as merely advisory. Background. Before the terrorist attacks of September 11, 2001, the commercial airlines conducted passenger screening, and administered the CAPPS I, subject to federal guidelines. In late 2001, the Congress passed the Aviation and Transportation Security Act, which created the Transportation Security Administration (TSA) as a unit of the Department of Transportation (DOT). This Act gave the TSA responsibility for airport passenger screening. In late 2002, the Congress passed the Homeland Security Act, which, among other things, created the Department of Homeland Security (DHS), and transferred the TSA from the DOT to the new DHS. The proposed new CAPPS II, the next generation passenger screening system, if implemented, would be a government (TSA) run system that replaces CAPPS I. However, it has been criticized and opposed by former Rep. Bob Barr (R-GA), the Electronic Privacy Information Center (EPIC), the ACLU, and others, on privacy grounds. (8) there are no specific privacy concerns with the technological architecture of the system." Section 519 also provides that during this testing phase, "no information gathered from passengers, foreign or domestic air carriers, or reservation systems may be used to screen aviation passengers, or delay or deny boarding to such passengers". It also sets a deadline of February 15, 2004 for the GAO to submit its report. Bush's Chadha Reservation. President Bush signed the bill. He also issued a signing statement in which he asserted that the Supreme Court opinion in INS v. Chadha, 462 U.S. 919 (1983), leads him to construe Section 519 contrary to its plain meaning. President Bush wrote that "The executive branch shall construe as calling solely for notification the provisions of the Act that purport to require congressional committee approval for the execution of a law. Any other construction would be inconsistent with the principles enunciated by the Supreme Court of the United States in 1983 in INS v. Chadha." He added that "To the extent that section 519 of the Act purports to allow an agent of the legislative branch to prevent implementation of the law unless the legislative agent reports to the Congress that the executive branch has met certain conditions, the executive branch shall construe such section as advisory, in accordance with the Chadha principles. See also, stories titled "Bush Signs Homeland Security Appropriations Bill" and "TSA Receives Comments In CAPPS II Privacy Proceeding" in TLJ Daily E-Mail Alert No. 751, October 2, 2003.